Tex Noel recently sent me a link to a list of numerous books, programs and other football memorabilia that have been digitized and are available on-line. 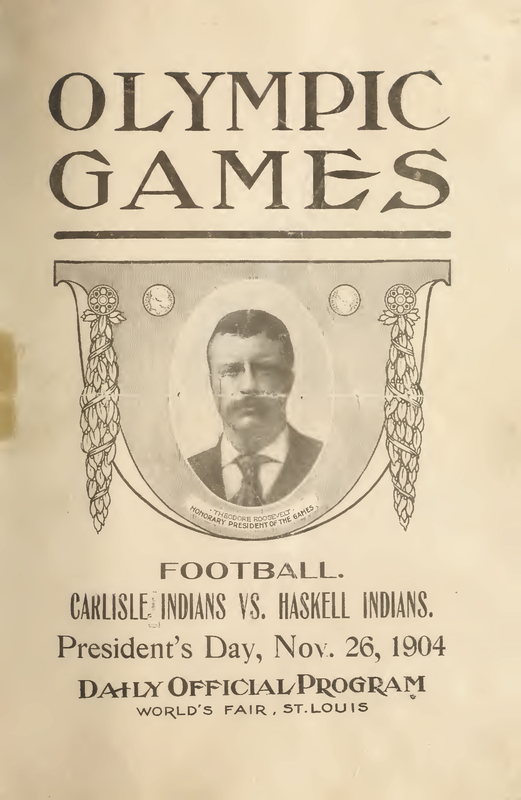 Included in the list was the program for the 1904 Carlisle-Haskell game which was held at the St. Louis World’s Fair, in part, for the entertainment of President Roosevelt who visited the fair but did not attend the game. Jude, Kennedy and Flores didn’t get in the game. Coaches Ed Rogers and Bemus Pierce suited up for the game. Hawley Pierce and long-time player Nikifer Shouchuk also played. The reason given for loading up the line up was that rumors swirled around that Haskell was even recruiting white ringers for the big game. That doesn’t seem to have happened. What did happen was that some of the best players ever to play at Carlisle could be found on both sides of the ball. 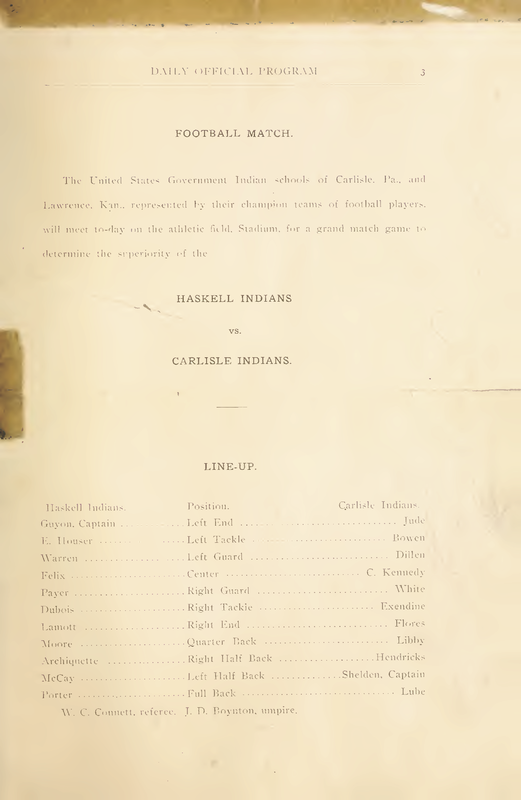 Some, like Archiquette had previously played for Carlisle but were at Haskell in 1904 (and would return to Carlisle in 1905). Others like Charles Guyon (Wahoo), Pete Hauser and Emil Hauser (Wauseka), would star at Carlisle in the years that followed. The two line ups amounted to a who’s who in Indian football at that time. This entry was posted on June 20, 2012 at 12:34 pm and is filed under Albert Exendine, Antonio Lubo, Archie Libby, Arthur Sheldon, Bemus Pierce, Carlisle Indian School, Charles Guyon, Chauncey Archiquette, Doctors, Lawyers, Indian Chiefs, Ed Rogers, Emil Hauser, Football, Haskell Institute, Hawley Pierce, Joe Libby, Pete Hauser, Wauseka, William Gardner. You can follow any responses to this entry through the RSS 2.0 feed. You can leave a response, or trackback from your own site.